Mapping the connections of the brain and linking the structure of the brain to its function is a recent hot topic. The mapping endeavor can be carried out on different levels. The goal at the meso and micro level is to reveal the underlying circuitry that allow the brain to carry out its intended computations. In this talk,I will describe recent techniques and progress in this field. 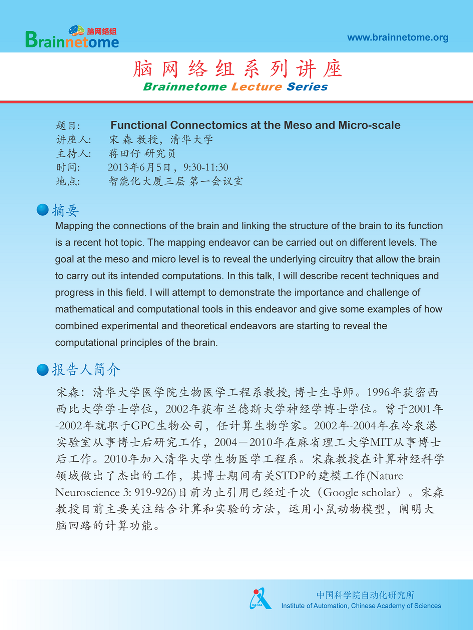 I will attempt to demonstrate the importance and challenge of mathematical and computational tools in this endeavor and give some examples of how combined experimental and theoretical endeavors are starting to reveal the computational principles of the brain. You can find the detail introduction about Prof. Song.